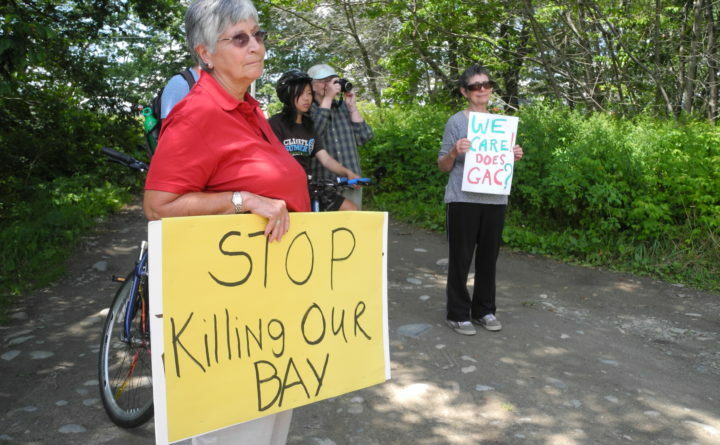 Environmental activists carrying signs listen in June 2013 as Ron Huber of Friends of Penobscot Bay talked about possible contamination of the shoreline from a succession of fertilizer and chemical companies located in the same Kidder Point site for nearly 100 years. By any measure, Penobscot Bay pilot David Gelinas has a hard job. In all weather and conditions, he travels miles out to sea to clamber aboard vessels in order to steer them and their cargos safely into port. But harder even than his work has been what he does in his spare time: advocating for the future of the port of Searsport and for the state’s working waterfront. He has spent years trying to push back against what he sees as intensifying “not in my backyard” opposition to any project or infrastructure upgrade proposed for Penobscot Bay. That includes even the ones he believes will make his job easier and safer to do, such as the Searsport Harbor dredging project, which was halted in 2015 amid fierce resistance. In midcoast Maine, there is a strong tradition of locals pushing back and sometimes beating outside development efforts, with one notable example the time in the 1960s that Belfast residents fought the state and avoided having U.S. Route 1 routed directly through the city’s downtown. Residents who have stepped forward to oppose specific projects disagree with the assessment they are anti-business. They assert that their opposition derives from a commitment to preserve quality of life and a “sense of place” endangered by businesses that arrived amid fanfare, then departed to the net detriment of the community. Poultry processing and, more recently, the MBNA bank card company, are two examples they cite. People who have stepped in to oppose proposed midcoast development during Gelinas’ lifetime include environmental activists, those who mistrust corporate promises, those who doubt the ability of state and federal regulatory agencies to ensure that corporations don’t sacrifice public good for profit and those — it must be said — who just don’t want their backyards to be altered. Ron Huber of Friends of Penobscot Bay has been fighting on behalf of the bay he loves for more than 25 years. He thinks that NIMBYism can lead to good results, at least in terms of delaying or halting development. But other Mainers believe that a small segment of the population is slowing Maine’s economic growth and affecting people who live far away from those ‘backyards,’ wherever they might be located. Social media is helping to amplify the “not in my backyard” voices, said Peter DelGreco, president and CEO of Maine & Co., who believes that what’s happening in the midcoast is a reflection of the increased anger and political polarization nationally. Maine & Co. strives to help companies establish successful operations in Maine, and one of their clients is Nordic Aquafarms, Inc., the Norwegian company that wants to build one of the world’s largest land-based salmon farms along the Little River in Belfast. The intensity of the opposition came as a surprise to DelGreco, who said that people around the world are paying attention to what happens in Belfast. He hopes not, saying that Maine needs economic growth, and is “uniquely” situated to attract it, as long as the anti-development voices are not too loud. Gelinas echoed some of these concerns, saying that in the past 20 years, he has watched as proposals to dredge the channel, to build a large liquid propane gas storage tank and terminal at Mack Point in Searsport and to bring any development at all to Sears Island have come to nothing. This trend, he believes, is a problem. Huber, the longtime activist, said that he sees some port development proposals as better than others and that opposition can make projects better. And if it seems that opposition voices are louder lately, it shows how much people love the bay in their backyard, he said. Gelinas, though, believes that opponents sometimes use scare tactics to rally less engaged neighbors to oppose projects. All of this, he said, is frustrating. Worse is that he’s not sure how the two sides can find common ground. When he attends informational meetings and they seem to be viewed solely as an opportunity for opponents to yell at or deride experts, it’s a problem, he said. As an example, he cites a meeting about the harbor dredging that was held in Belfast several years ago by the Army Corps of Engineers. A scientist came, answered question after question, showed videos, graphs and explained the science.